Who is it for? The Blue Heaven Long Wear Lip Color Lc 06 Trendy Pop is for all those people who love bright, glossy lipsticks. It is a coral color with a shiny finish. Read on for a full review of this Blue Heaven Lipstick! Price and Quantity – Rs. 105 for 6 mL of product. It is a liquid lipstick with a glossy finish. Open the cap by twisting it. Apply the lipstick all over your lips with the applicator. You can also use a lipstick brush to fill in the product. The quality of the applicator is not very good. It looks and feels a little cheap. The color of the lipstick is coral pink and it looks quite good on Indian skin. The names of the shades are misleading. Although Blue Heaven hasn’t given any names to the shades, Nykaa mentions this particular shade as Dark Pink, which is far from the real color of the lipstick. The pigmentation is also good. You need to take the product twice or thrice from the tube to cover your lips completely. The texture and feel of the lipstick are okay. It has a glossy finish, so it can also be used as a lip gloss. It does feel a little sticky on the lips, but that is the case with all shiny lipsticks/glosses. It has the general chemical makeup fragrance. My overall experience with this lip color is not good. 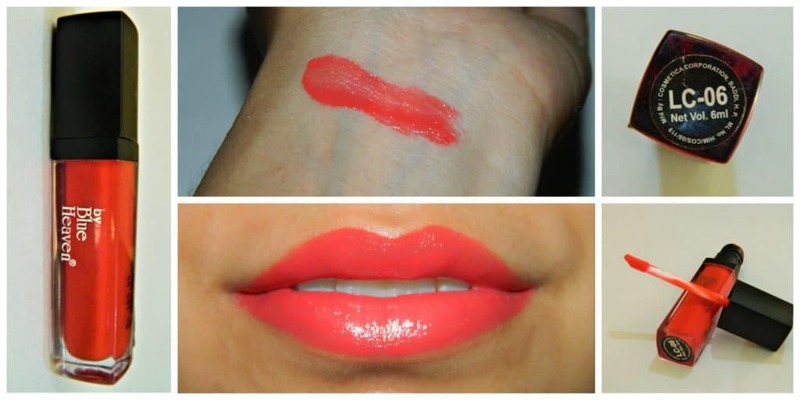 Even though the color is very pretty, and the pigmentation is good, the lip color feels patchy on the lips. The patchiness is not visible in the pictures, but you can see it if you take a closer look. Price range. It is quite affordable. The shade is very pretty. Gives a nice shine to your lips. It looks very patchy on the lips. The shade range is very limited. The shades are different as shown on the website. Shade is not mentioned in the product. Only a number is given. No. I wouldn’t repurchase this because the shades are very limited, and you can get a better lipstick under Rs. 200 easily. Although, if you are on a budget, you can go for this lip color.